Micromax Superfone A90S is the latest premium featured smartphone launched by Micromax and this article explains all its features, specifications and reviews. Read on the article to know the price, availability & other details of Micromax Superfone A90S. Micromax Superfone A90S is the latest premium featured smartphone from Micromax. Like Karbonn Mobiles, Micromax is one of the best Indian mobile manufacturing companies. It is the 12th largest mobile company in world. It released some other Android based tablets which are again hot gadgets in market. Micromax Superfone A90S is one of the best featured smartphones from Micromax. Micromax A90S has dimensions of 127.2 mm height, 66.8 mm width and 9.8 mm thickness. It weighs only 118.4 grams. Super AMOLED capacitive touch screen display is used as touch interface with 256K colors. Most smartphones these days come with 16 million colors. So, the color feature of Micromax A90S needs further improvement. This phone has a resolution of 800 pixels height and 480 pixels width with 217 ppi pixels density. There is no screen protection feature in this device. Micromax A90S has 4 GB internal memory with 512 MB RAM but only 2 GB internal memory is available for users. To store more data, a 32 GB external memory card slot is available. It supports GPRS, EDGE and 3G networks. The phone also has Wi-Fi, Bluetooth v4.0 and micro-USB v2.0 features. Micromax A90S is coming with 8 mega pixels primary camera having geo-tagging feature on rear side of phone and LED flash featured VGA secondary camera on the front side. Also, it has 1280x720 pixels video recording and 800x480 pixels video playback feature. Micromax A90S runs on Android Ice Cream Sandwich operating system. This phone is featured by MediaTek MT6577 chipset with 1.2 GHz dual- core processor. It has PowerVR SGX531 GPU processor for playing HD games and for graphic applications. Accelerometer, compass and proximity sensors are provided for a better gaming experience. It has HTML5 web browser which ensures better browsing experience and supports almost all web pages. It has Java, Radio and GPS facilities. Micromax A90S is available only in black color. Standard Li- Ion 1600 mAh battery is used for backup. This phone backs up to 180 hours of standby and up to 5 hours of talk time. The price of Micromax A90S is anticipated to be $250 or Rs.13750 in Indian currency. You can purchase this phone from major mobile stores or online shopping sites like eBay. Micromax introduced both these phones in A90 line. Both have a lot of similarities. They have same resolution, memory and camera. Micromax A90S has super AMOLED capacitive touch screen while Micromax A90 has AMOLED capacitive touch screen. Both phones run on same Android operating systems, chipsets, processors and GPU and have same battery strength. Micromax A90S has bluetooth v4.0 with A2DP feature while Micromax A90 has Bluetooth v2.0 only. Both phones are available only in black color. The price of Micromax A90 is anticipated to be $264 or Rs.14500 in Indian currency. 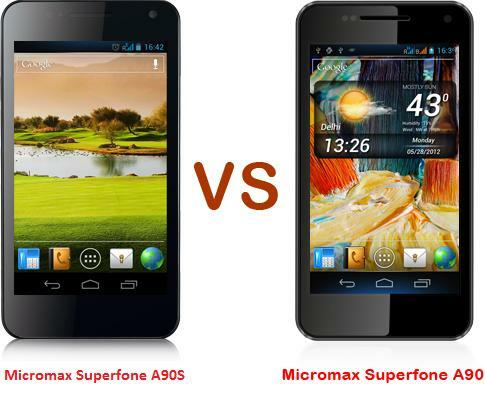 In my opinion, Micromax A90S is better than Micromax A90 as it has more features than Micromax A90. A brief review of Micromax Smarty A25 is given here with all its features and specs. Since it sports Android v 2.3 operating system and having a very lower price tag, it is now labelled as the cheapest Android phone released in India. It might become a trend in the year 2013 for sure just because of this price tag and impressive features. It has no 3G but having WiFi and other options for connectivity. Read more. Get the details about recently launched budget android mobile by Micromax. Here you can get the complete review of Micromax A90 smart phone which cost you Rs.12990. Read article below and share your experience. Read about the new Smartphone from Micromax. Micromax is going to launch Micromax A90 Android Smartphone which is really good Android phone in low price and the specifications of phone are also remarkable. So check out the new smartphone.